To address this need, for the past 20 years Mary Meeker has put together an annual presentation about the key trends in the internet and mobile world. The presentation covers a wide variety of topics including mobile advertising, wearables, apps, content distribution, IPO’s, healthcare technology, and lots more. Mary Meeker is a partner at venture capital firm Kleiner, Perkins, Caulfield, and Byers, and her annual Trends report has become an institution among people in the technology and media industries. Below are a couple of the most interesting points from this year’s report, and there is a download link for the full presentation is at the bottom of this article. Internet usage has grown from less than 1% to almost 40% globally over the past 20 years. Mobile usage has grown even faster, from about 1% to almost 75% of the world’s population. However, the growth is slowing as new subscribers are harder to get, and with most of the remaining growth to come from low income countries. Consumers’ usage of the internet and mobile internet is growing strongly, with about a 10% Y/Y increase in daily hours of digital media consumption. Mobile represents more than 50% at close to 3 hours, a massive growth compared to 5 years ago when it was less than one hour. Each new media – e.g. 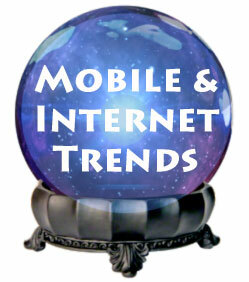 TV, Internet – has taken several years to evolve ad formats which fit the media well. Now, finally, it looks as though mobile optimized ad formats are appearing. These tend to be fast, fun, and often involve video. And in addition, Buy Buttons optimized for mobile are now appearing on more and more mobile sites and are contributing to the growth of m-commerce. Millions of mobile subscribers are now contributing User generated video on sites such as Snapchat. The audiences can also be huge, with some sporting events getting over 30 million views within a 24 hour period. Facebook is also seeing an explosion of video consumption, with up to 4 billion views per day, up 4x in the past 6 months! Growth in mobile ad spending is still strong at 34% Y/Y, although the growth rates for the industry leaders has been slowing. Spending on print advertising is still way over-indexed in relation to time spent with the media, and mobile is still strongly under-indexed (about $25billion in the US alone), indicating that there is still good room to increase. The full presentation consists of over 190 slides, and covers a wide range of other topics as well, including drones (industrial use & regulations), re-imagining business, cyber attacks, and how internet + mobile have revolutionized work in the US. Together, the data provided plus the qualitative comments paint a great picture of where our society is heading.